Over time, you will notice your computer slowing down and even the most basic tasks start to take longer and longer to accomplish. This is partly because the various programs that you use day in and day out all write pieces of data onto the hard drive and in the Windows registry, both of which eventually get clogged up with unnecessary bits of code. The process may take a while, but your computer will eventually be mired in a mishmash of useless data, with the most common results being noticeably sluggish performance and increased read and write errors. The best way to restore your computer to its previous optimum condition is to use a cleaner program such as SlimCleaner. SlimCleaner provides a “cleaner” feature that allows you to delete temporary files, log files, memory dump files, and all other unnecessary files easily. This helps you enhance system performance by freeing up space that can be used for more important storage and operational tasks. SlimCleaner also cleans up your various software applications including antivirus programs, word processing software, audio/video editing software, email and IM programs and so much more. This helps enhance the performance of these individual programs while improving the efficiency of your overall system. SlimCleaner is useful for cleaning up your Web browser’s cache and browser and download history. The utility also comes with an advanced features tab that allows you to clear out CBS logs and notification trays. This results in a much-improved browser performance. SlimCleaner allows you to stay on top of the cleaning process with a useful time counter that runs as soon as you start cleaning. Users also have the option to abort the cleaning process at any point, and restart it at a future time. 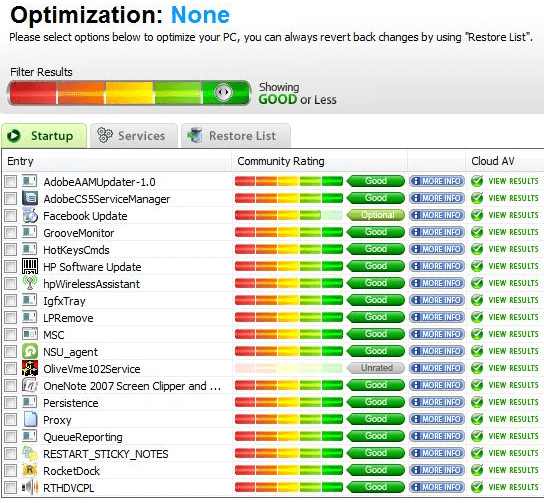 Users have the options to set system optimization in a few different ways. This provides the utmost flexibility with regard to optimizing your PC for maximum performance. 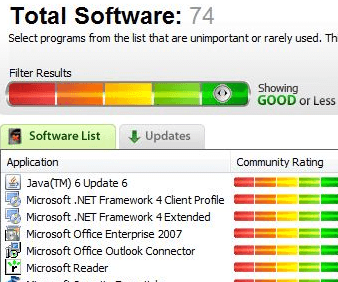 You can also choose which programs are to be removed based on usefulness and user ratings. 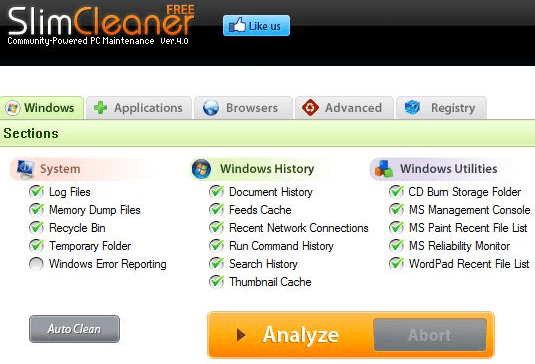 SlimCleaner gives you the ability to specify the rarely used programs that can be removed safely. In addition to helping you free up more space for your swap file and essential programs, this will also have a noticeable effect on boosting the performance of your system. 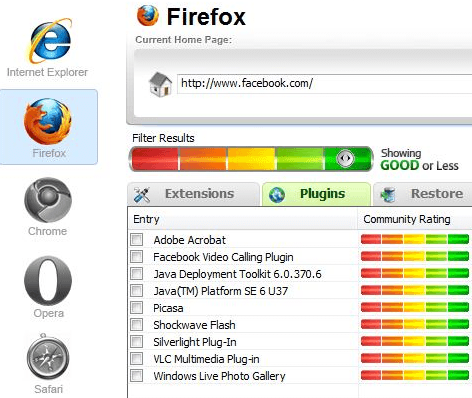 Browser plugins that you never use can also be removed with SlimCleaner. As with program cleanup, this feature allows you to remove browser plug-ins depending on frequency of use and usefulness. The hijack log allows you to scan for startup items, toolbars, BHOs, ActiveX controls, browser plug-ins and other third-party or malicious items that can “hijack” or modify a system. Once detected, such items can be deleted from your system. To help you keep tabs on how much free space you have available and how much you need to free up, SlimCleaner comes with a “Disk Tools” feature that gives you a quick summary of the space that data take up on your disk. You even get an “Intelligent” defrag feature that consolidates all the bits of fragmented data on your drive, speeding up loading and saving processes. You also get a Duplicate File finder that help you track down duplicates of useful files, allowing you to get rid of them. You can also schedule your cleanups and defrags using the inbuilt scheduler functionality. Finally, SlimCleaner offers a Windows Tools that works pretty much like the standard Windows Control Panel. 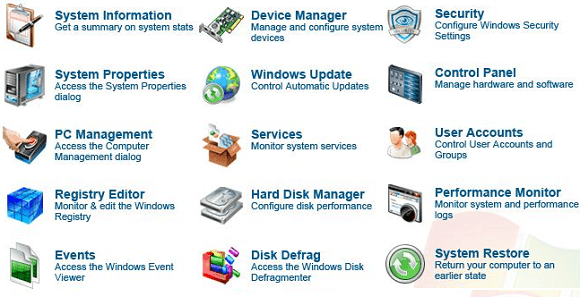 This gives you at-a-glance access to essential system information and enables you to manage your system from one convenient location.